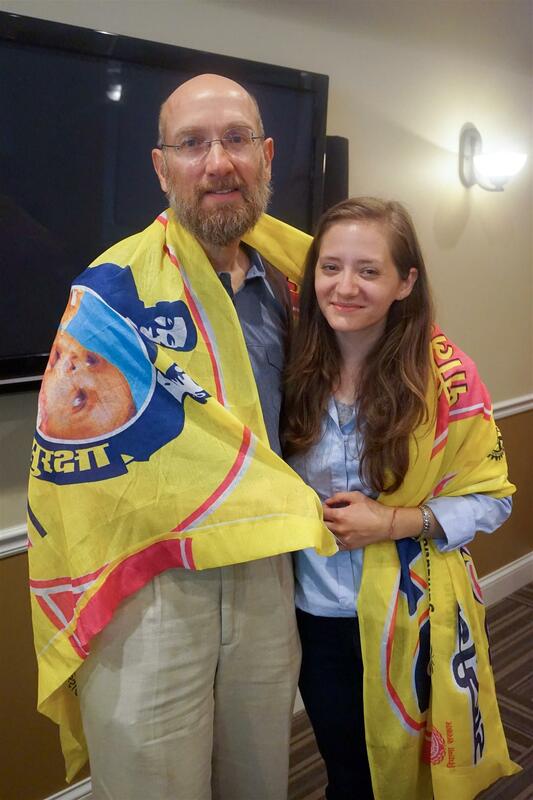 Rotary File for June 14, 2016 | Rotary Club of Iowa City A.M.
Jody Braverman and his step-daughter, Rachel Gomez, spoke at the June 14 meeting concerning their trip last February to participate in the India NID. Jody Braverman and Rachel Gomez draped in India NID banner. The June 21 meeting will be the last one for sign-up to attend the Year-Ender at the Ockenfels hangar at the Iowa City Airport, 4:30, June 25. Sign up to bring a side-dish, salad or dessert and pay $20 per person. Liz Nichols passed around attendance lists and suggested members check their profile at www.ICAMRotary.org for more details. There is still time to get in make-ups. Clubrunner will accept make-ups for up to 365 days. While make-ups are primarily to be for attendance of a Rotary-based event or club meeting, we do accept volunteer service to other non-profits as make-ups in the spirit of "Service Above Self." Attendance awards will be given out sometime in July for 2015-16 perfect attendance. So far about 40 members qualify. Myrene Hoover discussed the historical significance of Flag Day, which is on June 14 each year. The first American flag was given the blessing of the Continental Congress in 1777 and flew over the Battle of Brandywine. June 14 was first observed as Flag Day in 1889 at a school in New York City and gained in observance by other schools thereafter. Deb Dunkhase is recruiting for members to plan the food for the Take a Kid Outdoors event at Lower City Park on July 16 and is also passing around a sheet to get sign-ups for people to staff a food concession stand. We get to keep the proceeds from the sale of lunch and snack foods for this event. Nancy Stensvaag announced that theere will be a food drive for the Crisis Center in July. Dave Parsons is a Rotarian in the News with his latest Press Citizen article on his trip to Ireland. Cassie Elton was being interviewed on Channel 9 during the same time as the June 14 meeting about the Antelope Lending Library. There were numerous Happy Bucks, making up for a short Happy Bucksweek the week before. Jim Peterson introduced our out-going Assistant District Governor, Jody Braverman, and his step-daughter, Rachel Gomez of Denver, CO. Jody and his step-daughters attended the National Immunization Day (NID) in Haryana State of India in February 2016. Even though India has been free of new wild polio virus cases for quite some time it is necessary to continue to provide the polio drops to children who have not already been vaccinated until all new cases of polio have been irradicated around the world. There is a good chance that the world may be proclaimed polio-free by the time of the Atlanta RI Conference in 2017. Haryana State has been the site of some rioting for political reasons, not because of the NID, but the political unrest caused some delays in Braverman's NID team, and totally stopped some teams in other parts of Haryana. Jody also visited Chenai in the south of India where he met up with Usha Balakrishnan to attend a sister club to IC Noon Rotary. They attended the Chenai club's version of a Fireside Chat and checked out a local project that gave women training in tailoring. The main NID activity was in the north around New Delhi, which is the world's most polluted city. They visited the RC of Delhi Megapolis project of setting up Kosheh, or one room schools, for children who's families have migrated from other parts of the country. These students are considered immigrants and are not allowed to attend regular schools. The Kosheh schools provide a way for these students from other areas to integrate within the new community. There are 3 separate sites not funded by RC of Delhi Megapolis, each with one classroom. After the NID Braverman and his step-daughters did some sight-seeing in Agra and elsewhere.